While we here handle venomous snakes daily and love every minute of it, handling venomous reptiles is not what everyone aspires to do. This is not a bad thing, because if too many people did handle dangerous snakes, then there would be a lot more bites, fatalities and hospital costs, all of which would ultimately be paid for by the taxpayers! Notwithstanding this, there is a demand for properly trained and qualified people to handle venomous reptiles at various times. This includes times when snakes need to be removed from houses and other buildings, where members of the public may be at risk. Also work places, such as mining camps and a whole range of other situations have snake incursions and an ongoing need for someone trained to remove them. Hence the need for snake handlers and people to do snake catching courses. The snake man, Ray Hoser has been using his expertise to train others how to handle venomous snakes for more than fourty years. Because he has an unmatched perfect safety record, it is no surprise that he is the most frequently demanded teacher of snake handler courses anywhere in Australia, if not the world. Ray Hoser has trained people in all parts of Australia, including New South Wales, Melbourne and Victoria, Queensland, the ACT, South Australia, Tasmania, Western Australia, the Northern Territory and places overseas such as the United States of America, the UK and Africa. 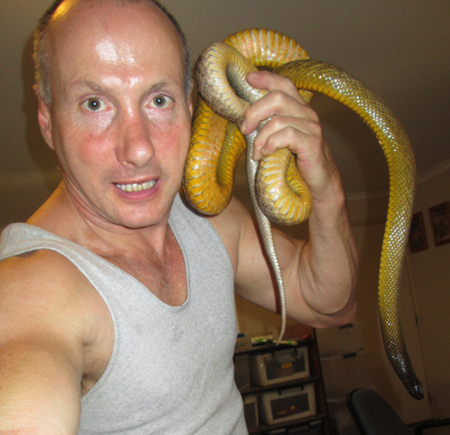 Ray Hoser's graduates now work as professional snake catchers in all parts of the globe, including Madagascar, Mine sites in several continents, Papua New Guinea, Irian Jaya, other parts of Indonesia and many other places in south-east Asia. As a reptile expert, Ray Hoser is also unequalled, having named species of venomous snake on all inhabited continents, including Eurasia, Africa, North and South America, as well as places like New Guinea. The snake handler courses Ray Hoser teaches are tailored to the needs of the students and are usually completed in a single day. Subject matter includes safety protocols, identification of species, animal welfare, safe handling and of course legal matters relating to reptiles from all relevant places. Extended courses may include advanced reptile husbandry and keeping and yet further legal requirements if needed in a particular jurisdiction, such as Australia. In Australia wildlife laws are insanely complex, ever changing and recklessly used to protect dysfunctional government-run businesses at the expense of others, excluding of course the corruptly protected few. Taught at a snake handling course are essentials such as seeking out to find, catch and relocate snakes, effective means of control and protocols, including what to do if the snake has fled by the time the snake handler has arrived on site. Graduates with a Hoser issued training course certificate have a distinctive edge over those who have done courses taught by less well known reptile handlers with relatively limited expertise. Zoos and others who need staff trained in snake handling give preference to those with Hoser issued certificates as they know they have been taught properly and by a globally recognized expert. Certificates issued by a number of other course providers are not only worth a lot less than a Hoser issued certificate, but are in fact worthless in many places. This is because a person taught the wrong way to handle snakes is harder to retrain than someone with no expertise at all who can be trained the correct ways from scratch.